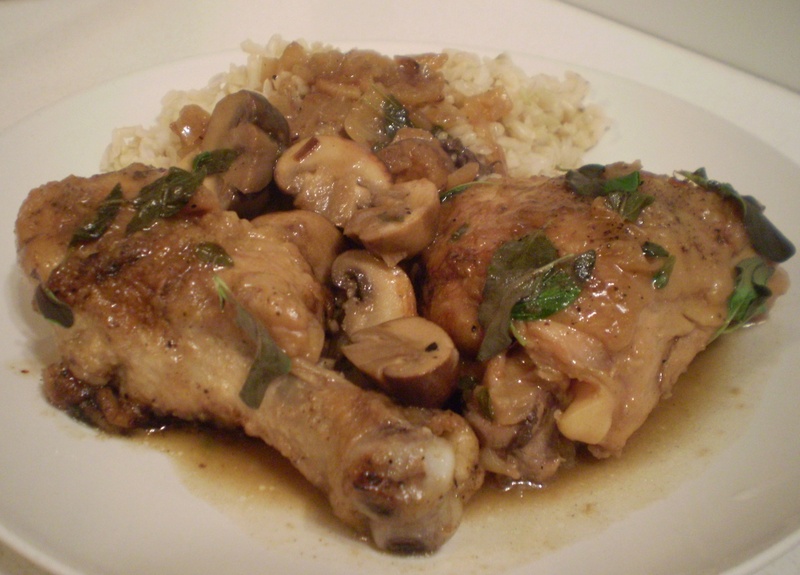 Chicken thighs and drumsticks braised in a white wine with mushrooms and onions. 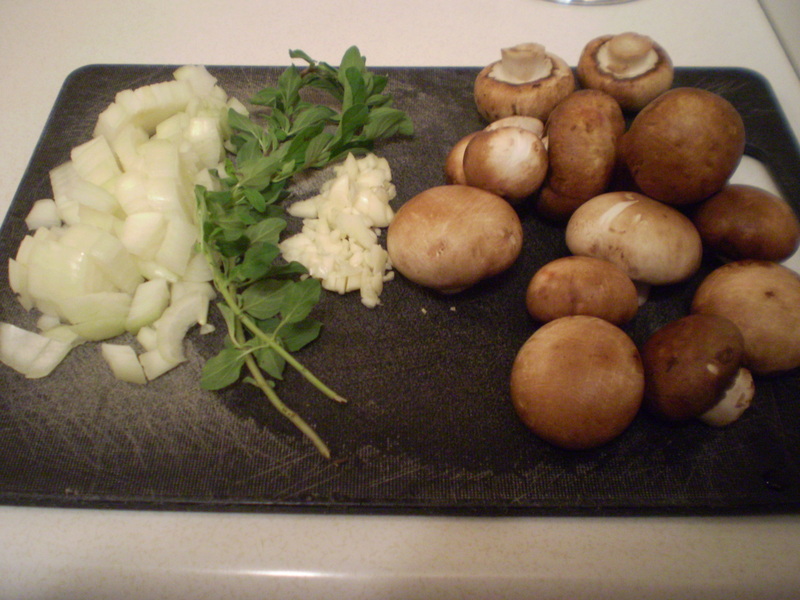 Onions, fresh oregano, garlic and cremini mushrooms. Chicken after it's been seared and browned. Thoroughly season the chicken with salt and pepper. Coat each piece of chicken with flour. Heat a pot on high heat. Add in oil first, then chicken. Brown the chicken so that the skin is crispy and golden. Remove chicken from pot. To the same pot, add in butter, garlic and onions. Cook until the onions are soft. Add in the mushrooms and oregano. Sprinkle a light dusting of salt and pepper. Give everything a good stir and then add in the white wine. 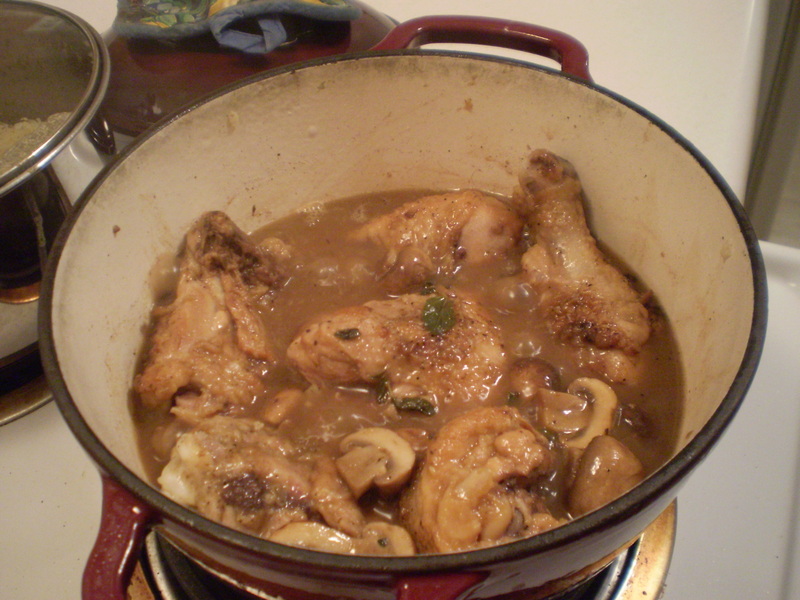 Once the liquids in the pot begin to bubble, add in the chicken and any juices that may of collected. 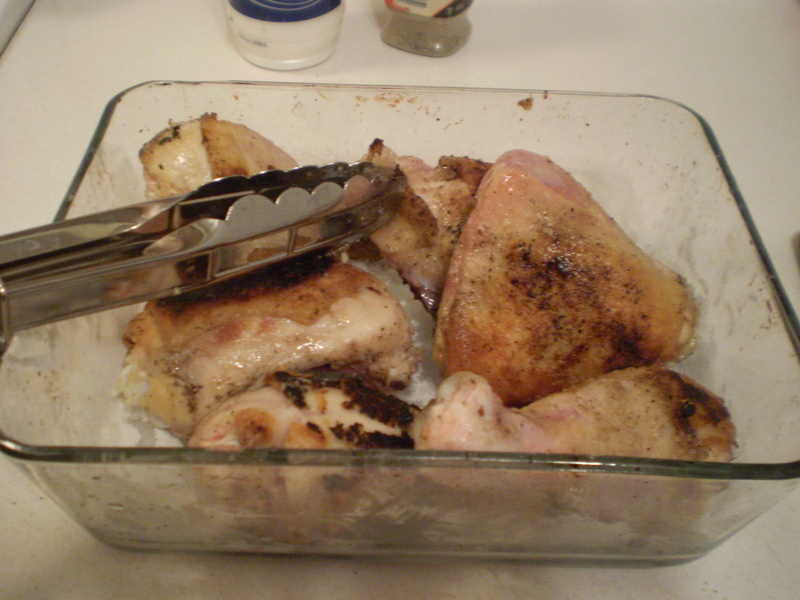 Cook covered for 30 to 35 minutes depending on the amount of chicken. Garnish with additional oregano leaves right before serving. Serve with plain brown rice and/or salad. Here's how the dish looks after 30 minutes of cooking. 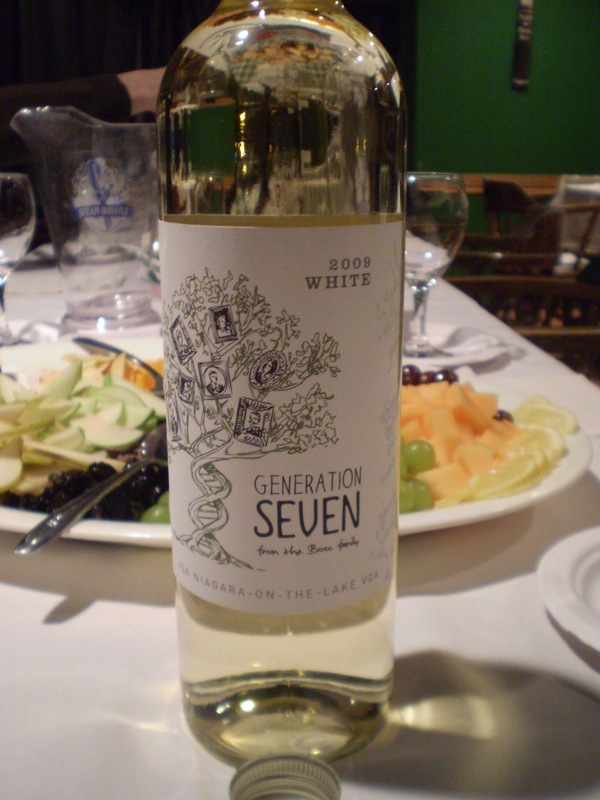 *For the white wine, I used Generation Seven which is a blend of Riesling, Sauvignon Blanc and Gewurztraminer. It is from Canada and retails for $13.95 (CDN). I sampled this wine at a wine tasting earlier this year and really liked it. 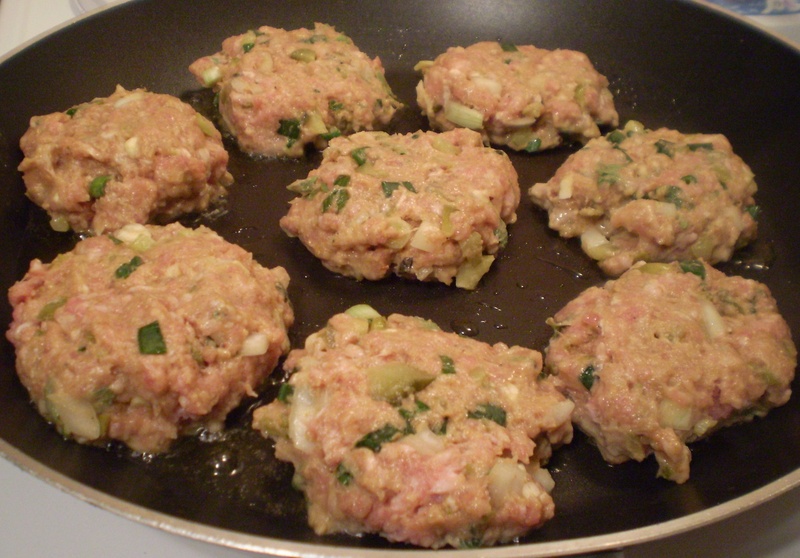 Homemade pork patties with sauce. 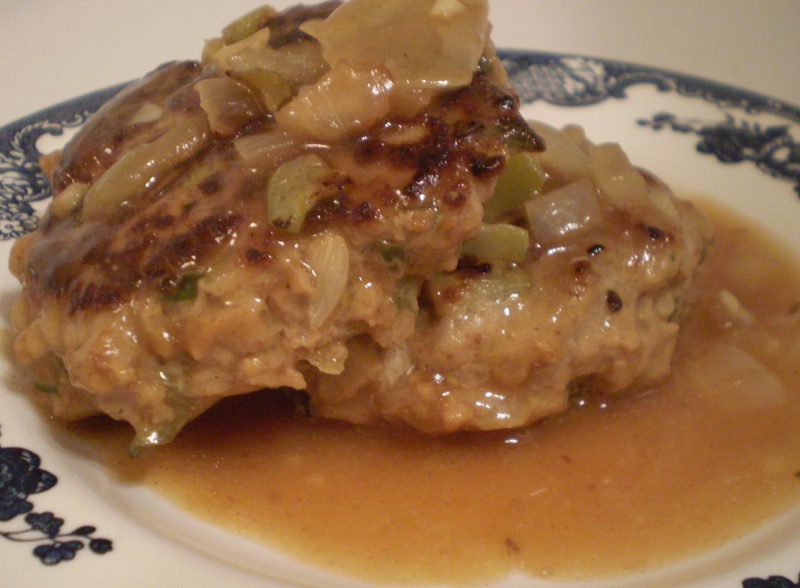 The following recipe is inspired by Canadian Living Magazine’s “Retro Pork Patties with Groovy Gravy”. 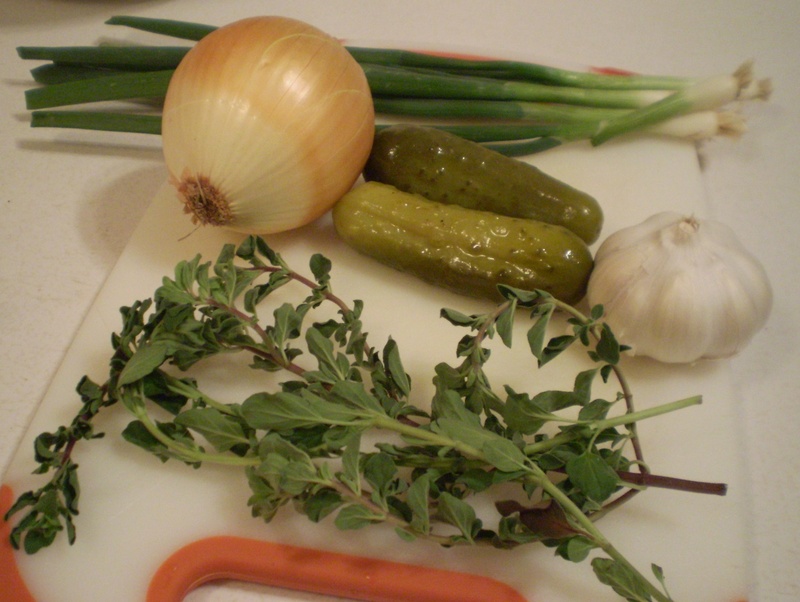 Garlic, green onion, fresh oregano, onion and dill pickles. These will eventually end up in the pork patties. First they need to be peeled, cleaned and chopped. In a mixing bowl, combine the ground pork, egg, green onions, half the amount of garlic, pickles, graham cracker, milk, half the amount of onions, salt, pepper, oregano leaves, mustard and half (3 tbsps) the worcestershire sauce. Combine well. Form 2 inch diameter patties with thickness about 1/2 inch. 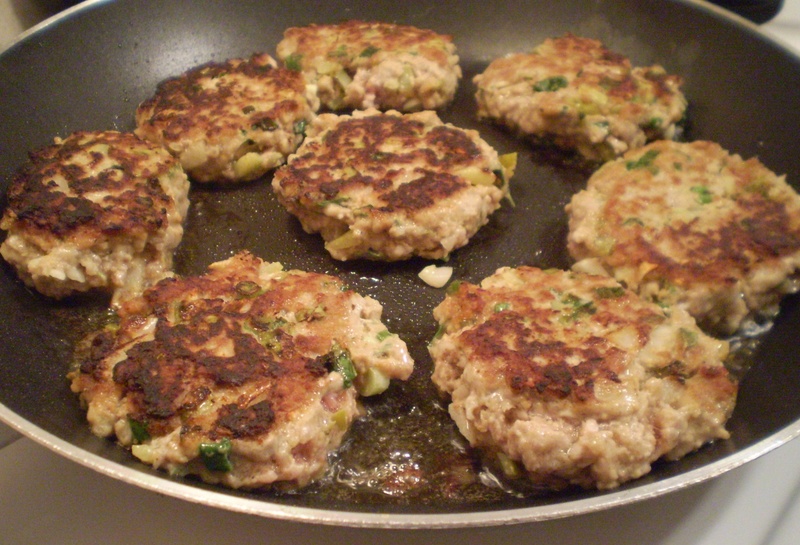 The pork patties just placed onto a hot pan. In the same pan, add in the remaining garlic and onions as well as the butter. Turn down heat to medium and cook until the onions are soft (about 5 minutes). Once ready, add in the sugar, vinegar, remaining worcestershire (3 tbsps), broth and cornstarch. As the sauce heats, it will thicken and bubble. When this happens, return the patties to the pan and cook for another 8 to 10 minutes so that the patties are thoroughly cooked. Serve with rice or mash potatoes. 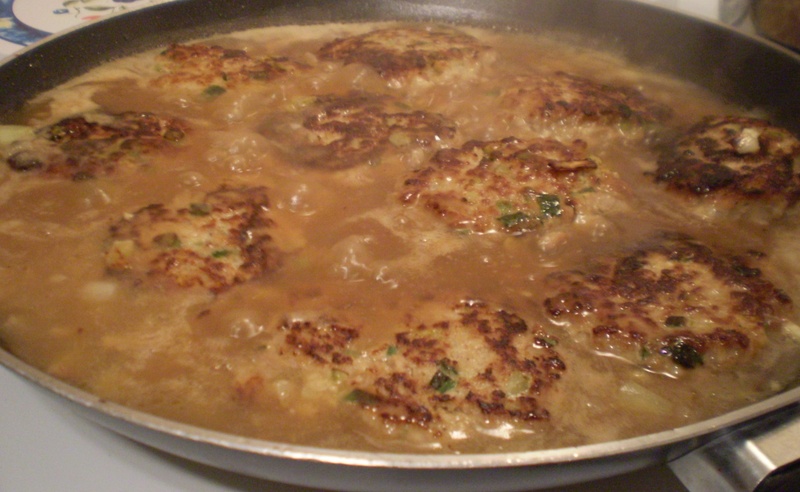 Patties simmering in a homemade gravy sauce.